Is there really such a thing as high and low functioning autism? Are the worlds of Aspergers Syndrome and Classical Autism really so far apart? And what of those 'Aspinauts' in the middle? What happens when these worlds connect to survive and thrive in a non autistic world. This book takes you on this journey. 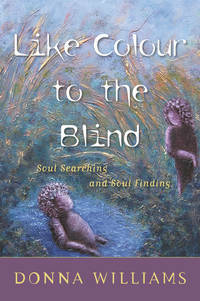 Published in 1996 Like Colour To The Blind is the third book in the autobiographical series and like each book can be read as a stand alone book. Like Colour To The Blind is essentially three intertwined stories in one book. After discovering that triggering technique of 'checking' can help them access their felt emotions buried deep under programed responses, Donna becomes unwittingly dared into marriage with Ian; a schizoid, fragmented man also on the autism spectrum. But where Donna has spent years tearing down the invisible walls of her Exposure Anxiety in order to join the wider world, Ian has plans for them to move to an isolated farm in the middle of the Welsh countryside, away from humans, to live with sheep, pigs and a 'horse that simply is'. Within this story is the moving account of their friendship with Alex, a teenager with autism, just beginning to find his voice for the first time through typed communication and determined not to be 'left behind'. After Alex gets tinted lenses that help him encounter a remarkable cohesive 3D world he's never known, Donna and Ian follow, seeing for the first time a world that their own visual perceptual fragmentation has never shown them. * Those interested in the journey of non verbal people into communication via facilitated and augmented communication en route to independent communication. Having a relationship of any kind can be a journey that takes you to places never before experienced. Add to that relationship another component, as in this case, autism, and you will see just how difficult and joyful the journey can be. In Like Colour To The Blind, Donna Williams has mapped out for us what having a loving, trusting relationship is all about. For those of us who take our relationships with others seriously, this book will cause you to take a second look and see there is room for improvement on that journey to experiencing the fullest of what being a "couple" mean. A remarkable addition to Donna Williams' first two international bestsellers and now sold internationally, you will laugh, cry and cheer your way through Like Colour To The Blind. Everyone was buzzing about with an idea to do an article for Life magazine. I had no idea what I thought, so got swept down their stream like a salmon swept along by a torrent. I phoned the airport. ˜How do I get on a plane home?' I asked. It didn't matter that the publishers had paid out thousands for hotels and flights, arranged itineraries and interviews with the leading journalists around the United States and Canada. Jean came to the rescue. She arranged to pick me up from the hotel and drive me back to her house in Connecticut. The sky-scrapers gradually gave way to water and sand and trees full of rusty, rustling leaves. ... We returned for our new tinted glasses. I put mine on. Ian's face was joined together. His eyes and nose and mouth and chin were all held together with equal impact in a single context. His neck and shoulders and torso and legs were also joined, not bit by bit as my eyes moved along, but as a whole picture. I looked around the room and it didn't seem so crowded, overwhelming, or bombarding. The background noise I had always heard before“ machine sounds in distant rooms, the hum of traffic, the mutter of people talking in the background“ was not even apparent. I felt I was swimming with the tide and not against it.